What you can do with Apple Watch? So after reading all about the new Apple Watch and what it actually is in our first blog in this Apple Watch series, the next thing to understand is what we can actually do with it! There are three separate things an Apple Watch app can do; app instances, glances, and notifications, which we’ll now introduce below. Firstly, you can make your own mini apps which can be installed on the watch when you download an app on your iPhone that supports Apple Watch. These are essentially mini apps which can assist your apps core features but using a UI that makes sense for a watch. For example, Apple will be launching a “Photos” app which will display all the photos you have on your phone in a grid that you can zoom in on individual pictures. These will be installed on the Watch by an App on the iPhone. Glances are a second way for users to enjoy your app, they offer small “timely and contextually” aware bits of information. For example, a weather app might have a glance which displays the next hours weather for the current GPS location. Not all apps need to have a glance, and users will be able to choose which apps are allowed to appear on their glances list. 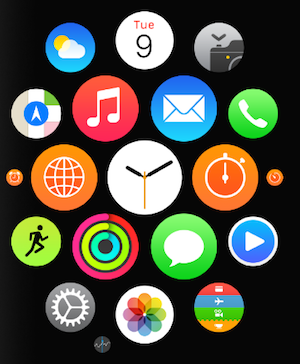 Finally, the Apple Watch will be able to display push notifications that would usually appear just on the iPhone. 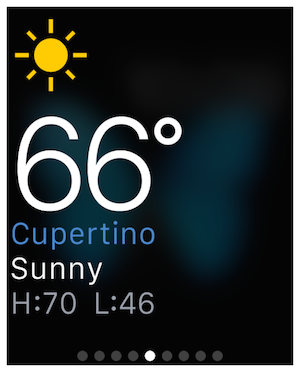 Notifications that come through begin as a “short look” notification which display your apps Apple Watch icon, a title, and your apps name. If you keep your wrist raised the notification becomes a “long look” notification which can provide a lot more information about the notification and different actions to dealing with the notification. For example a photo app could push a notification each time someone uploads a picture – the short look notification would contain the information that there was a simply a “New Photo”; whereas the long look would display the photo, information about it, and actions such as commenting or starring the photo. There are lots of interesting things to think about whilst looking at making Apple Watch apps, but there are certain things that can and can’t be done from a developers perspective. Our next blog in this Apple Watch series will explore what developers will be able to do with the watch.